Since the 1970s, there has been a continuous effort to acknowledge women artists in history. As part of this effort, the Galt Museum and Archives in Lethbridge, Alberta has curated an exhibition on artist Edith Fanny Kirk. The exhibition entitled, A Legacy of Adventure & Art: Miss Edith Fanny Kirk, focuses on her sense of adventure and distinguishes her artistic achievements and legacy. 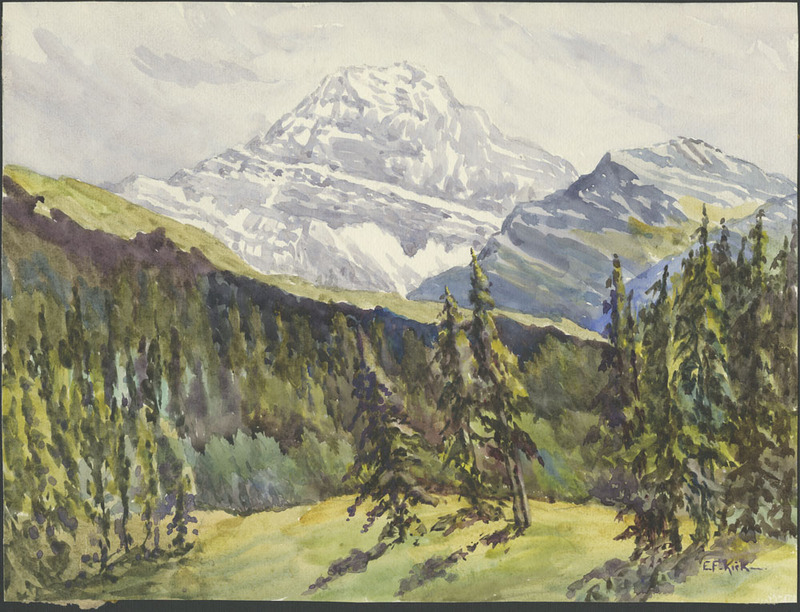 The exhibition will include four watercolours from the Library and Archives (LAC) collection, and will be on display from June 6 until October 12, 2015. Kirk was born in England in 1858 and immigrated to Canada in 1905. She eventually settled in Lethbridge, Alberta, where her artistic influence as an art teacher was fundamental to the community. She also presented papers on art at the Mathesis Club of Lethbridge and has been credited with the development of the Lethbridge Sketch Club in the 1930s (now the Lethbridge Artists Club). The four watercolour paintings from the LAC collection included in the exhibition demonstrate Kirk’s adherence to the medium of watercolour—as opposed to the more traditional oil paint. 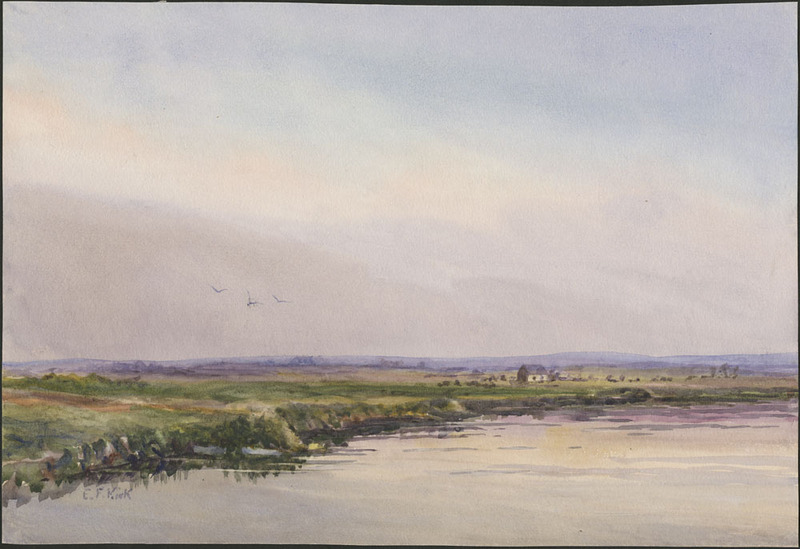 Watercolours are ideal for rendering delicate tones and soft colour transitions, and this technique is especially apparent with the hazy atmospheric sky in Prairie in Weather Made Smoky from Forest Fires, Lethbridge where birds fly through a subtle cloud of smoke. Watercolours would have been a preferred medium for working outdoors as they were readily available, portable and compact. Kirk hiked backcountry trails and national parks to paint as a member of the Alpine Club of Canada, which she joined at age 60! Kirk’s painting of the now iconic Mount Edith Cavell, Jasper Park, Alberta demonstrates the expansiveness of Jasper National Park. We can see how the peaking mountains continue off the page so as to appear as if they infinitely continue, and the depth of the trees is rendered in purples, greens, and blues. Kirk painted at a time when it was challenging for women to support themselves as artists due to social pressures and economic disparity. A Legacy of Adventure & Art: Miss Edith Fanny Kirk is an opportunity to look closely at her life and artwork, and to enrich our understanding of Canadian art history. Be sure to visit the Galt Museum and Archives exhibition on Edith Kirk. You can also read more about women artists’ self-portraits in the recent blog post, Self-portraits by women artists in Library and Archives Canada’s collection. This entry was posted in Art, Exhibitions and tagged Edith Fanny Kirk, Galt Museum and Archives, Watercolour, women artists by Library and Archives Canada Blog. Bookmark the permalink.